Aleko Konstantinov Theater of Satire is a unique cultural institution, highly influential and particularly meaningful for this country’s theater life. 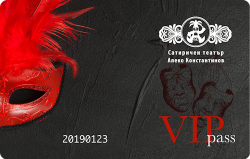 It is Bulgaria’s only genre theater for comedy, which has earned its status of one of the most popular, favorite and open-minded theater houses in Sofia. Here audience members are always welcome guests and close conversationalists. Humor, the prowess of the house, draws people together so they feel they belong to a community that employs art and wit to deal with the burden of being. The Theater of Satire has established itself as a dynamic artistic institution distinguished for its present-day stage voice, impulse and sensibility. Throughout the years Bulgarian intellectuals of the highest rank molded the aesthetic criteria of our theater. They created and keep on shaping its unique profile making it the audience’s favorite. Alongside Bulgarian talents, artists from Russia, Romania, the Czech Republic, Serbia and France have staged their productions here. Some of the greatest Bulgarian theater and movie stars were part of the troupe and a new generation of theater talents is thriving on its stage. The theater boasts a troupe of 38 actors, a technical crew and production ateliers. Performances are played on two stages: the main one, Thtastlivetsa (500 seats) and a smaller one, Metodi Andonov (100 seats). A new chamber stage (80 seats) for innovative shows is under way. Some 37-45 shows are staged in the house each month, and some 8-12 are on tour. Theater of Satire provides a stage for Defisto children’s theater studio. The theater produces some 12-14 new shows each year reaching an audience of over 100,000. Exhibitions, book premieres, anniversary parties and other side events are regularly held in the lobby. Aleko Konstantinov Theater of Satire has scooped a number of national awards and distinctions; it has repeatedly been shortlisted for prominent art festivals in Bulgaria and abroad. In addition, it has staged numerous shows upon the invitation of Bulgarian cultural institutes in Budapest, Bratislava, Vienna, Paris, Moscow, Skopje and many more. Our productions have toured across Europe, North and South America, Africa. We at the Theater of Satire seek to infuse our talent and efforts into humor, irony and laughter. In response, our loyal audience has shown its affection.